Herman Miller 6×6, used AO2 with 54 inch high panels. 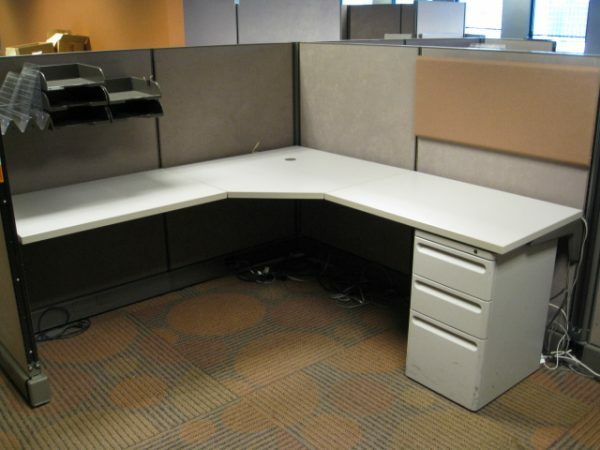 3′ corner worksurface and 3′ return worksurfaces. 36×54 panels are the main panels with 24×54 panels that are used as wing panels. There are a lot of 36×67 panels so that we can make all high stations or high-low stations or all stations that are 54″ high which is seated privacy. Box/Box/File pedestal included that is locking. One tack-board on each station and most have a tool bar with tools. Stations are powered with base-in power feeds. 36″ wide over-head flipper units can be added to the 67 inch high panels. Panel fabric is brushknit Inner Tone Dark 6502, paint is MT. Product is located in Cleveland Ohio and ready to ship. 100’s of Herman Miller Reaction chairs available in several colors.